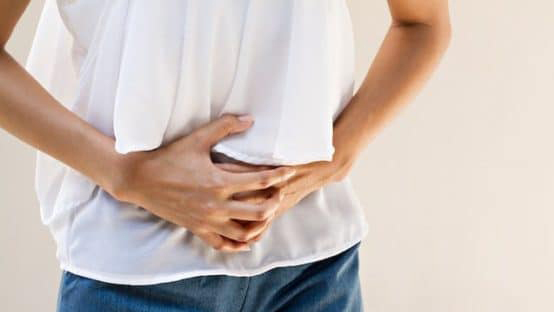 If you suffer from indigestion, bloating or sluggish bowel movements, be inspired by the Chinese and add Chinese radish and Chinese cabbage to your diet. 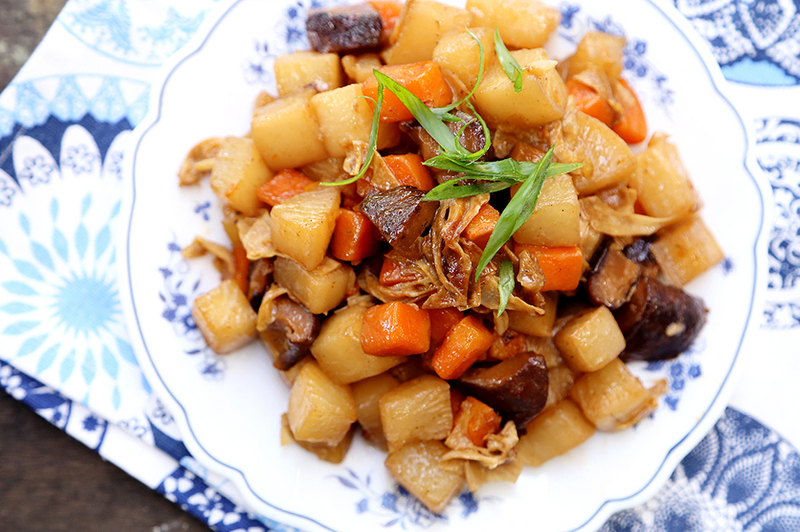 These two vegetables are extremely popular in traditional Chinese cooking, both at home or when eating out. In fact, there’s a popular saying in certain regions of China, that says: “Eating more Chinese radish and cabbage can keep you healthy”. 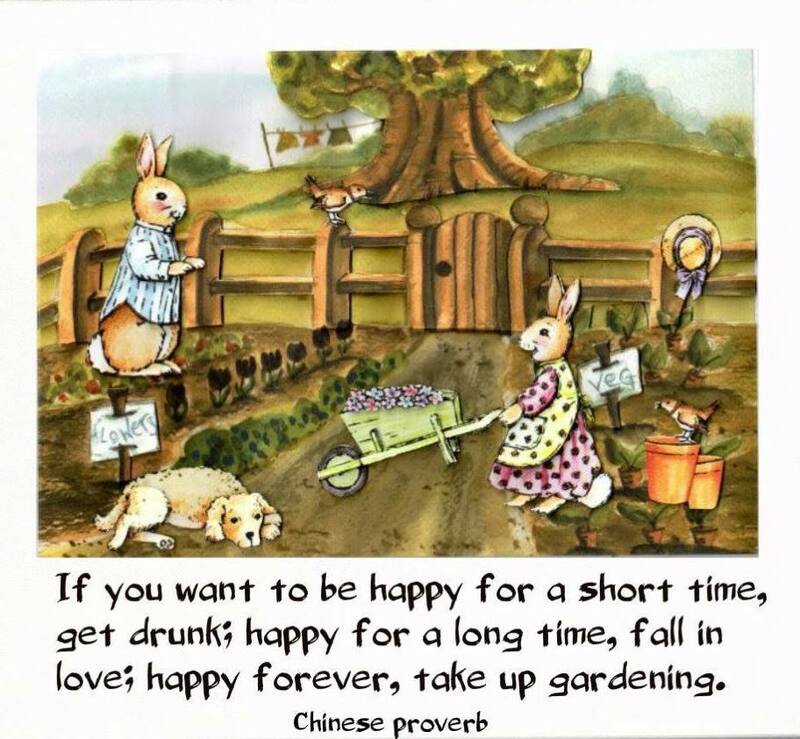 In China, it’s not uncommon for the family to cook Chinese radish if someone in the family is suffering from indigestion (also known as food stagnation). Chinese radish can benefit all members of the family, and can be made into dishes including Chinese radish cake, Chinese radish porridge and other Chinese radish sweets. Chinese radishes feature in many restaurant dishes, and are readily available in most Chinese markets. 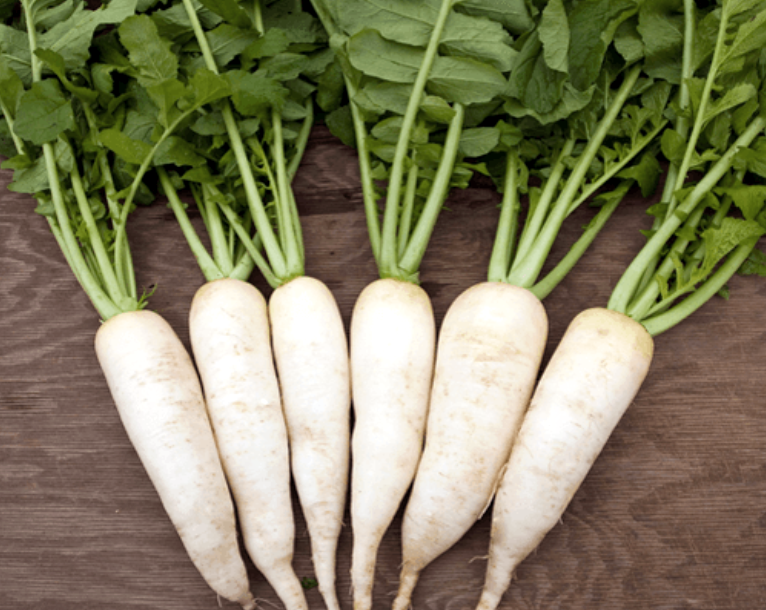 This article will look at the health benefits of Chinese white radish. Information about Chinese cabbage can be found in a separate article. In Chinese medicine the Spleen system controls our digestive system. Sometimes when the Spleen is weaker or if you have eaten too much, it can take a long time to digest food and metabolise it. Undigested food in the intestine will cause accumulation of heat and toxins, known as food stagnation. Children suffering from food stagnation will tend to cry in the evening, suffer from unsettled sleeping, have a red face, perspiration on the forehead, and a poor appetite. Clinical experience has shown that diabetes, obesity, hypertension, high cholesterol and fatty liver can all be associated with long term food stagnation. Whether you are an adult or a child, food stagnation can have a significant impact on your health. 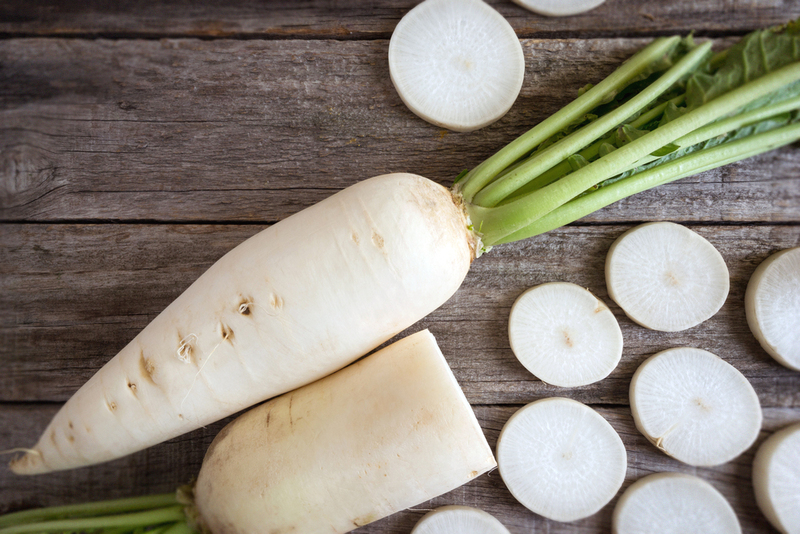 If you are suffering from any of the above symptoms, or are being treated for indigestion, adding Chinese white radish to your diet will help improve your situation. If you would like to know more about food stagnation, please see our article about eggplant. An ancient traditional Chinese herbal book from the Tang dynasty called Tang ben cao states “white radishes taste sweet and spicy, have cooling characteristics and acts more on the digestive channels. It helps to digest food quicker and move the food down the intestines, so it can help with indigestion and avoid food stagnation”. Chinese white radishes can be very helpful in treating symptoms of food stagnation, as mentioned above. If you eat white radishes more often, they can help prevent fat from accumulating around the stomach, and prevent food stagnation. 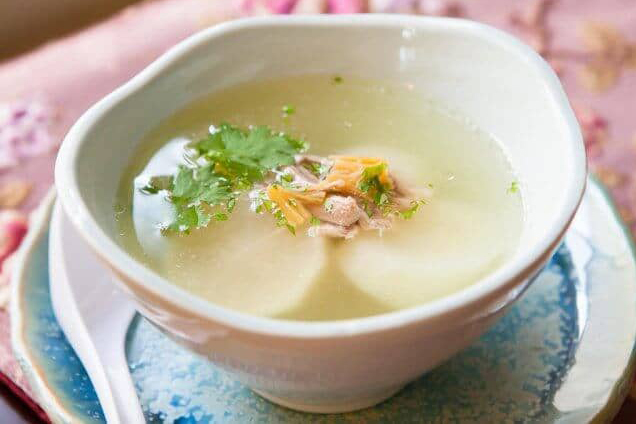 Eating white radish and ginger soup or white radish and carrot stir fry (see the recipes below) is a great way to improve your condition. Chinese medicine considers phlegm to be stored in the lungs, yet it’s not always produced by the lung. 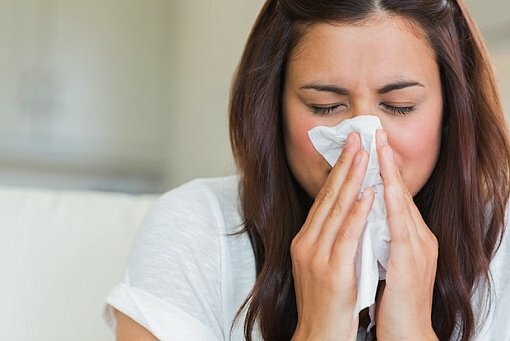 Phlegm can be produced from two areas – lung disorders and the digestive system. Lung disorders that produce phlegm include the common cold or flu, heat and cold in the lungs, and from long-term smoking. To quote Chinese medicine: “Phlegm is stored in the lung, but produced from the Spleen”. Eating white radish while you are undergoing treatment for this type of phlegm problem, can help improve your condition. Stir fry Chinese radish, carrot and ginger in the oil and water for 10 minutes on low heat. Add spring onions, salt and pepper to taste. Effects: Helps digestion; clears bloating and fullness; helps bowel movements. This is a very common and popular recipe, and is very easy to cook. It also smells delicious. Combine all ingredients and bring to the boil. Simmer for 10 minutes. Add the coriander just before serving, along with salt and pepper to taste. Effects: Helps move food down in the intestines; avoids food stagnation; improves digestion and metabolism. This is a very tasty and popular salad to eat during summer. It tastes delicious and is crunchy. It’s even popular in Japanese cuisine. Simply add the finely chopped radish to any of your favourite salad, or you can eat it alone with your favourite salad sauce. Effects: Clears heat from the liver and intestines; improves digestion and metabolism. Avoid eating Chinese white radish if you have diarrhoea. If you’re unsure if Chinese white radish is suitable for you, please see your experienced TCM practitioner. Good Article helps me improve my quality of life and stay healthier. Thank You! 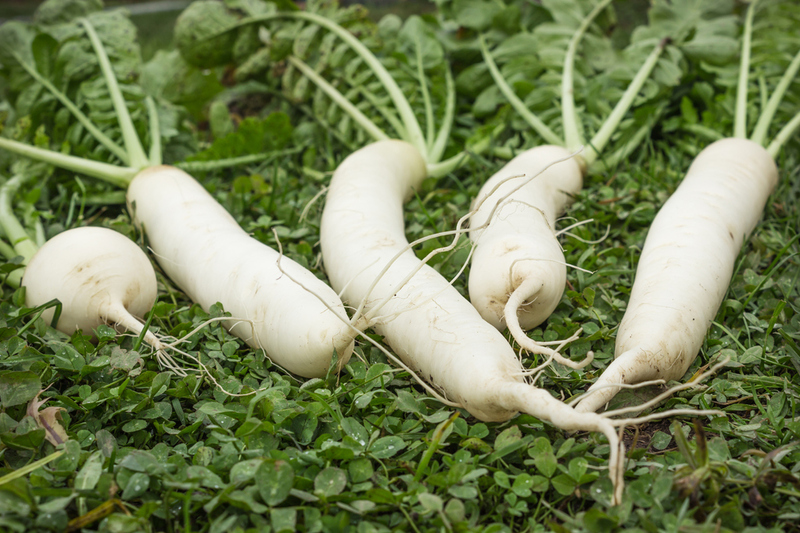 White radish is such a great food to help digestion. 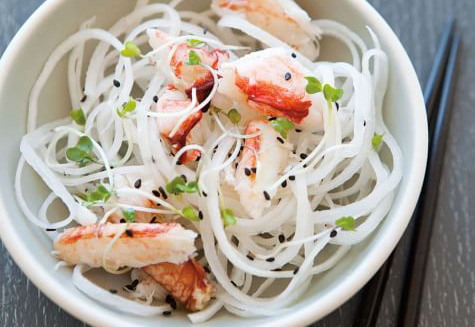 We hope you enjoy these simple and traditional recipes!